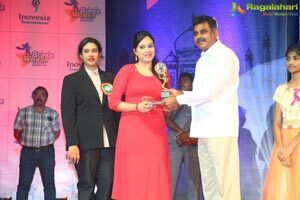 Hyderabad, 17 September, 2017….It is the celebration of women power and a measure of women empowerment that befits the immense contributions made. In what can be hailed as an exalted recognition, 18 women achievers from diverse fields of specialization have been added to a new league-Super Women India: Women On Mission To Empower The Nation. There is no denying the fact that many a brave woman has successfully penetrated into what generally was presumed as male-bastions. Not only have they carved a niche for themselves with their expertise in their chosen area but they set new benchmarks that are the envy of the world. In keeping with its endeavour to recognize talent and appreciate their achievements by taking it newer vistas, Inovexia International Pvt. Ltd has short-listed 18 women achievers for this year’s roll of honours. We strive to bring people together to share, disseminate, and propagate the ever-changing face of technological innovation and breakthrough discoveries on the frontiers of healthcare, medicine, sciences, business, and various industries around the globe. Saturday, September 16, saw an enthusiastic assemblage of unique personalities as part of the award distribution ceremony that was graced my luminaries from a multitude of specializations. 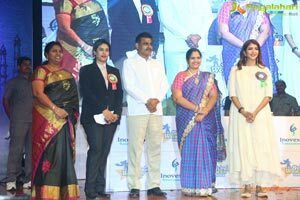 The audience present at the JNTU Auditorium, Kukatpally, was mesmerized by the thought-provoking speeches and personal anecdotes dwelt upon by eminent personalities like actress Jeevitha, Manchu Lakshmi, actress, Shri Konda Vishweshwar Reddy, Lok Sabha member from Chevella, Vakiti Sunitha Laxma Reddy, former Minister and Sunitha Mahender Reddy, Chairperson of Zilla Parishad. 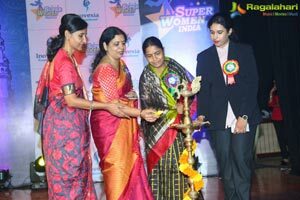 Super Women India is a reward for excellence and got contributing positively to the society, including in fields like business, politics, law, education, social work, health, hospitality, media and police. 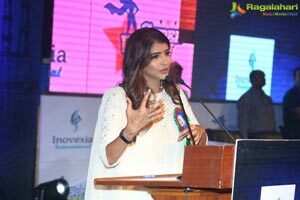 CEO of Inovexia Dr Geetanjali Reddy, and the chief organizer, stated that the awardees were short-listed from a large number of contenders. 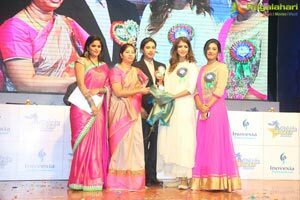 Jeevita Rajashekar wished that more and more such workshops on women empowerment are held all over, particularly for a male audience. Apart from the speeches, what made for a lively entertainment were the other programmes that were held on the occasion. The 12-year-old Guinness record holder Baby Sarayu, sketch artist Harsha, who has the genius to draw pictures of people live and in two minutes flat and singer Arun, who was dexterous while rendering songs in female voices, captivated the gathering and drew loud applause. It was a Saturday night fever that neither the winners nor the speakers and definitely not the gathering will forget. May the tribe grow! Hail Women Power!